Sunglasses and sunhats, check. Day packs ready, check. Magnifying glass for closer inspection of nature, check. Thirst for knowledge and a sense of adventure, check. 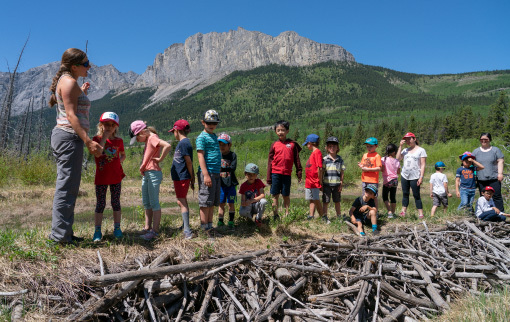 The mission for this Grade One class of Nature Explorers: to find different flowers, plant, creatures, and natural wonders of Kananaskis (and if really lucky, spot a beaver or two). Stepping off the bus at their trailhead location in Kananaskis [the Willow Rock Campground], the Nature Explorers get ready for their day of discovery. After some instruction from their Program Lead “Lynx” (Cristin Geestman), these Explorers are ready to go. They start to make their way in a single line through the trees to an in-forest amphitheater. They gather around and the crowd starts to quieten down: it’s time to talk beaver tales (and tails). 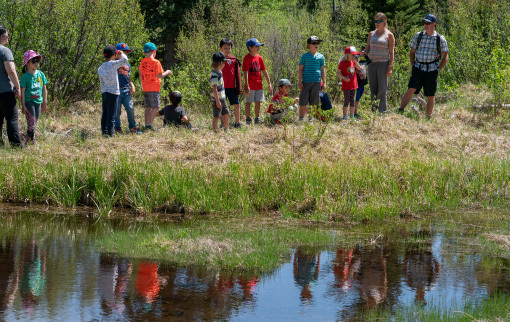 The Nature Explorers listen intently about the lives of who they’re here to keep a look out for: the families of beavers that reside in the marshy, wetlands close by. Did you know that one beaver will chop down approximately 200 trees per year? Did you also know that a beaver can live to be up to 20 years old? These interesting facts and stats about beavers, as well as details about their fur, teeth, and how they keep happy and healthy, are all covered by Lynx (she’s the beaver expert, and after her talk to the Nature Explorers, they’re now little experts too). Time check: let’s get ready to set back out on the trail. 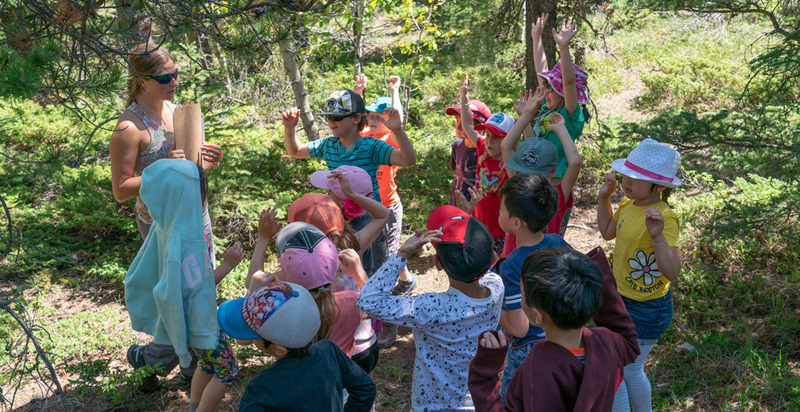 The Nature Explorers grab their discovery gear and are off to see what they can find, heading deeper into the forest under the careful guidance of their group lead Lynx, and teacher Ms. Hollett. Along the path, these curious Grade Ones correctly identify various types of wildflowers and shrubbery (using their magnifying glasses to be absolutely sure, by checking the colours, shapes and details of the flowers and plants). Then, surprise: a toad family make a welcomed appearance from the side of the trail. It’s an exciting find, with some Nature Explorers getting the chance to carefully hold the toad (but very gently; if it’s one thing that every Nature Explorer knows, it’s that all wildlife need to be respected and protected by humans). Further around the corner, the trail opens up and the Nature Explorers make their way through the grass. They’re getting closer to the Beaver Dam region, and so it seems only right to mark the occasion with a group rendition of ‘The Beaver Song’. Lynx enthusiastically kicks things off: “We walk, walk, walk like a beaver. We swim, swim, swim like a beaver. We chomp, chomp, chomp like a beaver. We squeak, squeak, squeak like a beaver…”. After a good sing-song, these mini scientists get back to their discoveries in the field. They’ll be discussing their outdoor findings when they get back to the classroom, keeping a Nature Explorers Journal of their research field trip. 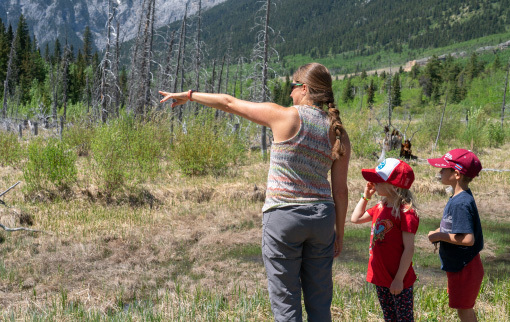 Well, these eager beaver Nature Explorers certainly look like they’re in their natural habitat, learning and discovering on the Kananaskis trails. 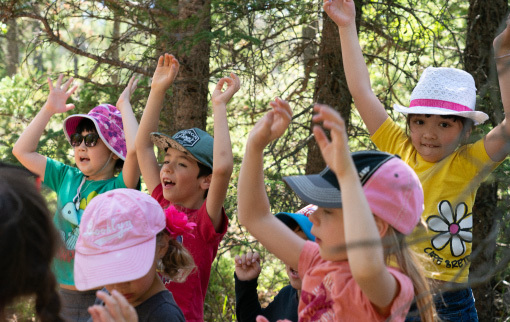 The Nature Explorers program, a CPRS learning initiative developed to enhance in-class learning with complementary outdoor lessons, is made possible through funding from The Wim & Nancy Pauw Foundation. 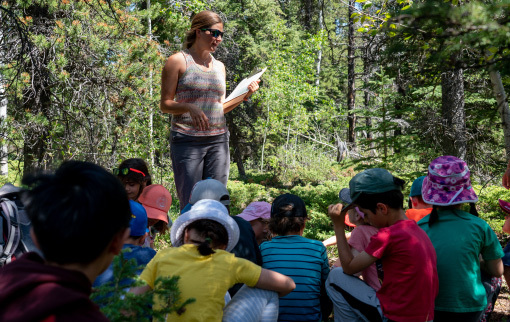 The program is kindergarten to Grade 6 inclusive, and features multiple topics and subject matter, including: The History of Banff (Social Studies), Life Cycles (Science), Wetland Studies (Science), Plant Form & Function (Science), and Evidence and Investigation at Johnson Lake (Science), [to see more details and go behind the scenes of the Evidence and Investigation session with the Grade 6 students, see here Nature Explorers tackle crime investigation and wildlife tracking, all in the name of science.